In one of our earlier blogs, we talked about how to keep your toddler entertained on a flight. However, as many parents discover, it’s not always the actual flight that’s the issue. Getting through the airport can be a very stressful experience when you’ve got a toddler. This is especially true if there’s delays, or if your little one is particularly grumpy that day! If you have an unpleasant airport experience, it’s going to negatively affect the flight and in turn, the start of your trip. 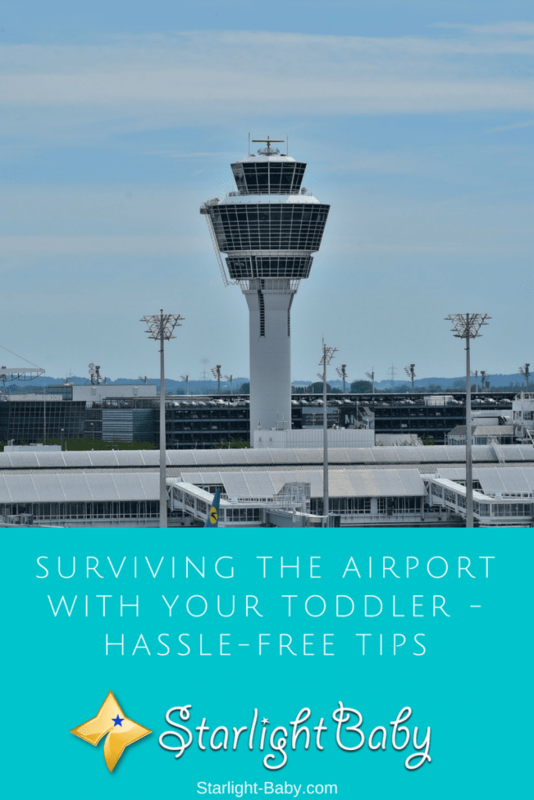 So, if you want to ensure your vacation gets off to the best start, here you’ll discover some great tips and advice on how to enjoy a hassle-free experience with your toddler at the airport. Before you choose an airport to fly from, it’s worth doing a little research to see which ones offer the best family-friendly service. You’ll typically find a lot of airports these days are keen to show off how family-friendly they are. So, it shouldn’t take you too long to establish which ones have the better child-friendly facilities. The types of facilities on offer can include play areas, baby changing and feeding rooms, and dedicated areas where you and your little one can view the planes taking off and landing. Knowing exactly where these toddler-friendly facilities are before you go will ensure you can take your toddler straight there when you arrive. If there is no dedicated child’s area, you can always provide your own entertainment. One which tends to go down well and enables your toddler to get rid of all of that excess energy, is the instruction game. This game is simple, yet really fun for toddlers. You can also adjust the rules a little to suit the airport you’re in and how busy it is. The best part is they will use up a lot of energy, making them more likely to sit quietly on the plane. It also encourages healthy brain development so it’s educational and a great distraction! Another great way to keep your toddler entertained on the flight, is to take an airport goodie bag. This can include anything from sweets to toys and sticker books. You don’t have to spend a fortune. Look online on auction sites such as Ebay. You’ll often find much cheaper items on sites like that, just remember to order well in advance to allow time for postage. If you give your toddler the goodie bag as a surprise at the airport, they’ll be thrilled by their new goodies and it’ll definitely keep them busy for a while! Sticker, activity and coloring books are particularly great items to add as these provide sometimes hours of entertainment! You could also include a new book that you could read to your toddler while you wait for your departure. You don’t need to have money for this idea. If you do, you can let them choose something from the shop. If you don’t, or you simply don’t have room to carry anything with you, you can make up your own little game. Ask your toddler to find specific items from a list and see if they can find the cheapest prices. For example, you could ask them to find the cheapest chocolate. Obviously, some toddlers may be a little too young for this game so you can help them if needed. Not only does this keep your little one distracted, but it teaches them the basics about different prices. You can also teach numbers by getting your toddler to count things in the store. Using unique experiences to teach valuable lessons is always a great idea. Another fun airport game you can play together is “Spot It”. This involves seeing how many people are wearing pajamas (you’d be surprised! ), or how many people are wearing UGG boots. You can use literally anything for this game, it doesn’t have to be clothing. Again, it keeps their little minds active and can entertain them for quite a long time. If you’re facing pretty long delays, it could be worth asking the airport staff about nearby activities. Is there a park close by for example? If there is and you’re facing a wait of around 4 or 5 hours, it could be worth popping along to the park with your little one. Just remember if you do leave the airport, you will need to go through security again when you get back. Therefore, you should leave plenty of time to go through security and get to the departure area. Does your toddler have a favorite teddy bear or toy? If so, pack that in your hand luggage and use it as a back-up. It’s like a secret weapon that can instantly calm and soothe your little one, so don’t use it unless you really have to. Ok, so these don’t exist, but your toddler doesn’t know that! If all else fails and you’re struggling to calm your toddler down and get them to behave, telling them there are special airport police which look out for naughty children is a fantastic way to keep them in check. A surprising number of parents do this so don’t feel bad! Sometimes, a little white lie can literally save your sanity. Perhaps it’s best to wait and use this as a last resort, but so many parents find it effective that we couldn’t leave it out. Overall, keeping your toddler entertained at the airport doesn’t have to be as difficult as you think. By following the tips above, you’ll have hours of entertainment available to keep your toddler distracted, even when you’re facing potentially long delays! If you’ve got more airport games or tips, please share them below! I can only imagine how stressful doing the whole airport waiting and boarding the plane can be. I don’t have any experience with it just yet because we have sea and the beach around 2 hours car drive away from where we live. So, we go there every year now that our boy is a tiny bit older. This is some great tips though and I will make sure to bookmark this article just in case we decide to fly somewhere in the future. We have some relatives in Canada that keep inviting us over so you never know! The special airport police one made me laugh a bit. That’s a very neat trick, thank you. I have never brought my children to take a flight before, so I have not encounter these issues. I think playing games or finding a place to allow the kids to walk around or even run around might be good. I have seen toddler climbing in the waiting lounge while I was waiting for a flight, I think it is fine as long as it doesn’t disturb others. The goodie bag is a good idea, I always have it in my bag whenever I go out. It does help to keep the kids busy. A snack box too! I also have not had the chance to take my kids on a flight when they were young. All of our trips are by car and on long trips, that means stopping from time to time for the restroom, etc. I never leave home without their favorite snacks, otherwise, it would be difficult to “contain” them in the car for a few hours, haha. I have taken them to different places and thank God I was able to raise them to behave when they are in places outside of our home. I have seen this become a problem with some kids who loiter around and touch everything they see and sometimes end up destroying/breaking things. Kind of annoying. A wonderful amount of tips. I have often been fearful of traveling with toddlers. However, I think that I can now give it a try. This blog entry arrived to my life just in time! You see, we’re planning to take a plane in August and I’ve been pretty anxious about it, since it’s our first plane trip with our daughter. I know she will be delighted, but my concern is that she’ll be SO happy that she’ll become a little ball of energy and therefore I won’t be able to keep her calm enough, both in and outside the plane. She likes to explore a lot, and I think her energy will reach a peak by then. I’m definitely using these tips and hopefully, the vacations will go smoothly! Thank you very much. I hope your trips will now go smoothly with the help of these tips, RoseLady. We’re really glad this helps. You’ll now be able to direct your daughter’s energy to something more productive 🙂 Best of luck to you! My niece had this issue with her kid when they were waiting at the airport to clear my baggage which was delayed for no apparent reason. Everyone was getting restless including me. I was meeting this kid for the first time and I was an object of interest for her. She took to me and I took charge. We went around the airport and did some of the things that you too have listed in your blog. Yes. It works if they distracted from the boredom one experiences at airports. I am yet to take my kids on a plane trip yet but I have taken them for long bus trips. I guess the same principle would apply to both scenarios. Firstly, make a long list of all you need for the trip and mark it off your list as you pack for the journey. Its very easy to leave behind a favourite toy in the rush. Provide as much games as you possibly can. No sweet snacks at all. This gives them a sugar rush and its more difficult to get them to calm down and take a nap. Rather provide non-sweet snacks like dried fruits or wheat biscuits suitable for kids. And give water in moderation. Not too much but not too little either. Traveling with kids can be quite fun and enjoyable if everything is planned beforehand. Thanks for pointing out the sugar rush effect, joegirl. Yes, I do think sweets should be limited because it can perk them up. I also agree with you 100% about listing everything needed for the trip because as you said, it’s very easy to forget something important if one is rushing. We don’t have many options to choose in our town. There is only one airport. Even when we fly to another town and cities, we cannot choose an airport because in my home country there is only one airport in each town/city. Some busy airports have children area where kids can play and have fun, however, this feature is not available in many airports in the country. taking airport goodie bad and visiting duty-free stores in the airport premises are great ideas. Letting the toddler watch rhymes on a tab can be a good way to keep him busy when you are waiting in the airport. A lounge for kids at an airport is a big plus because they can pre-occupy themselves with activities while waiting for flights. Without a distraction, the kids will get bored and become rowdy or grumpy. All I can say is thanks a lot for the information provided here on this article, words cannot express how much it means to me because it’s definitely going to be very useful for me anytime I’m traveling with my family. You are very much welcome, Martinsx. We’re really glad you found these tips helpful. Thanks very much for everything and knowledge the blog have added to my life ever since my participation here. Dealing with kids and their upbringing is not an easy task at but from the information shared here, things have been a little bit easier for me and my family.